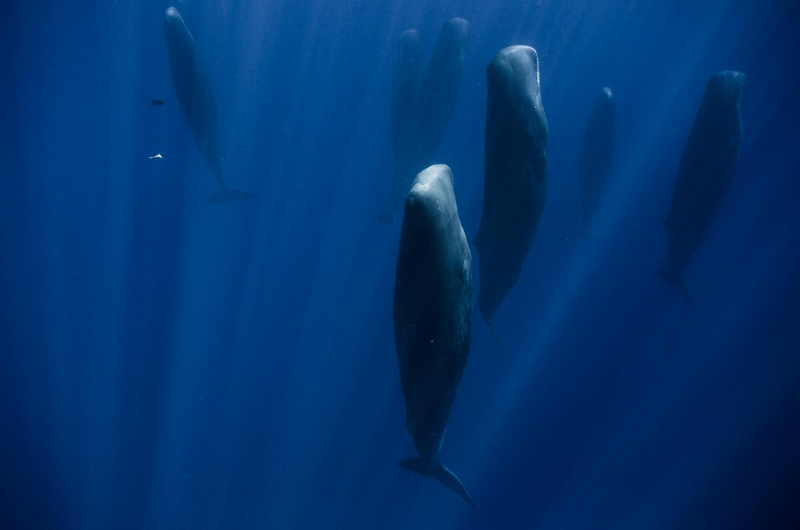 Scientists, according to National Geographic, have discovered that sperm whales have dialects and accents. Images of sleeping whales shared on Facebook by Organic Rising. Full set of images on National Geographic. This post is my contribution to One Liner Wednesday hosted by Linda G Hill. This entry was posted in Blogging, Nature and tagged #1linerweds, #Sperm Whales Sleep on August 9, 2017 by Deborah Drucker. Interesting way to sleep, but now that I think about it that’s how I would sleep in the water as well. Isn’t it though? So beautiful. I don’t know if our bodies would allow us to stay vertical. “Rut rhrow” I wouldn’t want to have to answer. Every species is valuable. But whales are especially special. I can see this happening. Good message! I was so amazed by the photo of the whales sleeping vertically in the water. They would have much to tell us if we could understand them. 🙂 Thank you, JoAnna. Reminds me of a certain Star Trek movie, though it wasn’t God asking, just some powerful aliens. Every creature in creation is valuable in itself. Every creatire has value beyond being consumed for food or “entertainment.” Every creature in creation has something to teach us. This is especially true of whales.